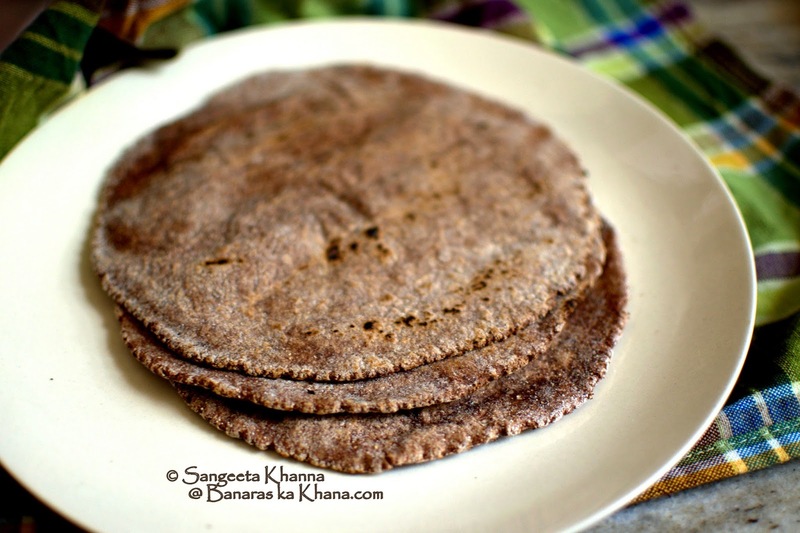 How to make ragi ki roti easily is the question everyone asks when I suggest them to try it. Ragi is the Finger millet that is highly recommended as a healthy alternative grain. 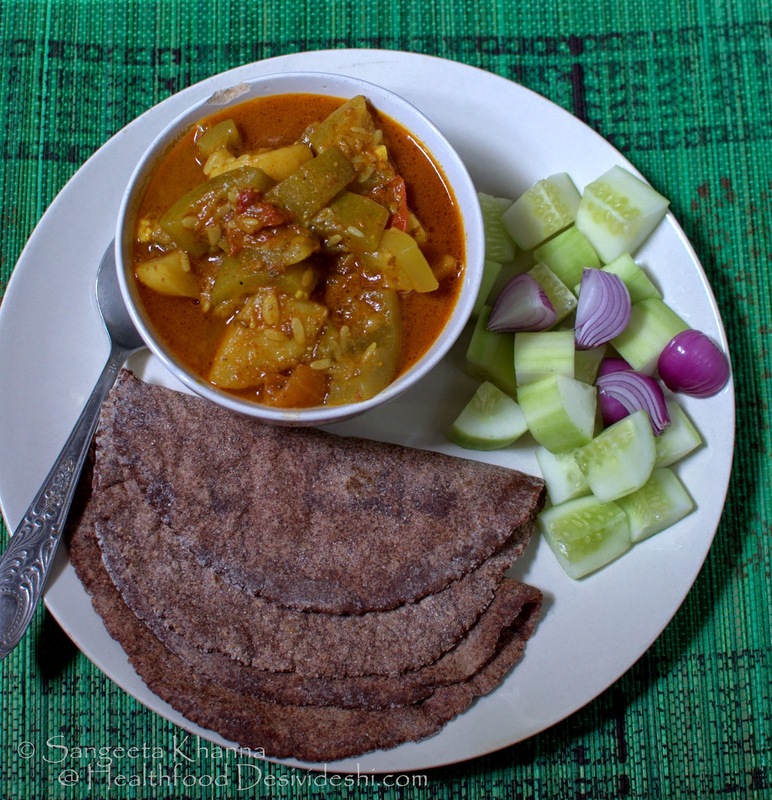 Making flat breads or ragi ki roti with it is a challenge for many and I used to get a few requests now and then. It is actually quite easy if you use your microwave in the dough making process. 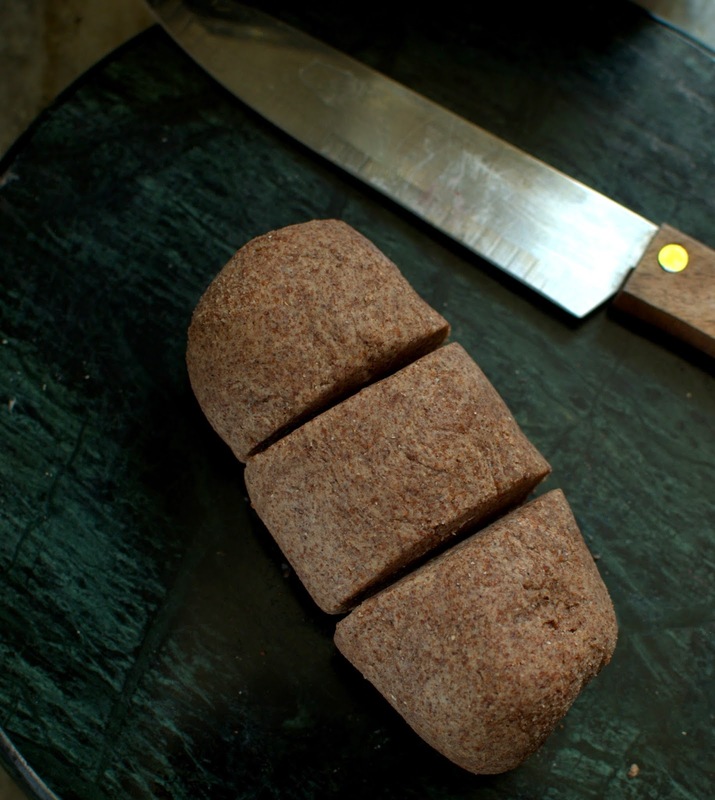 You can easily make the ragi roti dough by heating the ragi flour slurry in microwave and then kneading it like any other dough. Ragi is also known as Nachni, Mandua or finger millet in different languages. I had clicked these pictures long back when someone was not able to make millet flour rotis, I had sent her all these step wise pictures in mailbox but forgot to post on the blog. Here it comes for all my friends and readers. We love rotis made with mixed flours and individual millet flours as well, this Ragi roti is enjoyed most with a chokha or a mash like Hummus or Baba ghanoush. It actually behaves like a cracker if you cook it for a couple of minutes on the flame. If you cook quickly it stays soft as a normal whole wheat roti should be, just a little fibrous in mouth feel when the roti gets cold. The procedure to make the dough is a little tricky if you are doing it for the first time. The flour is mixed with water to make a slurry and then cooked either on stove top or in microwave so the slurry cooks and makes a glutinous dough. Ragi flour turns glutinous when cooked like this. If you do it in microwave, the process becomes really easy though. The dough looks like this..
And roll out a roti as you would do for a whole wheat roti, using some flour for dusting.. Wait for another 30 seconds and then fluff it up on open flame. The Ragi ki roti is ready. You see this way of making the dough takes about 5-6 minutes if you are using a little more than a cup of Ragi flour and your Ragi rotis come out nice and soft. Most importantly they don't crack and stick to the rolling surface. Recently I clicked pictures of a quicker method that I worked out to make ragi ki roti and other millet flour rotis and bhakhris. I make a thick slurry or a very loose dough of the flour and microwave it for a minute (for one cup flour and 1 cup and a little more water). Then mash the sticky cooked dough with a sturdy fork or potato masher before kneading it with hand for a few seconds. See these pictures for more details. The kneaded dough is rolled and cut into smaller portions to roll out rotis like above..
A nice meal with ragi roti is something to look forward to. I hope this post will be helpful to many who are trying to include gluten free grains or other whole grains in their diet. Ragi has multiple health benefits and I have posted a Ragi dosa, a Ragi uttapam and Ragi Idli in the past. More ways to include this wonderful grain in your daily meals..
Is Ragi the same as Bajra? If it is - what a brilliant way of making the roti!! It's not Bajra Mina. Ragi grains look like black mustard grains, a bit smaller. Health recipe, love ragi recipes very much...this looks so yummy and tempting. Looks delicious n healthy.. Love the clicks..
oh nice!!! cooking the ragi first like pathiri (rice roti) i guess. I have been making this by mix parts besan and atta. Hi sangeetha, I tried this and i lovvvvvvvvvvvvved it , my daughter too,,,Thankk u soo much!! Wow ! 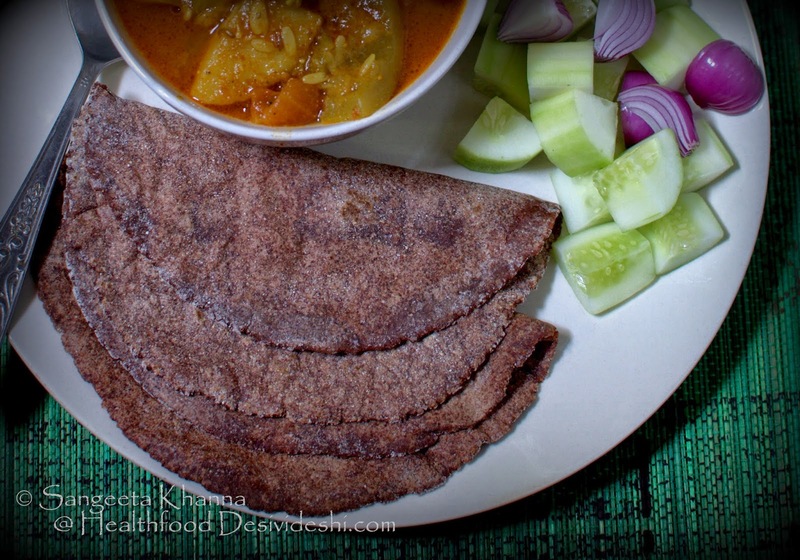 We make ragi roti in Karnataka so differently - patted like a pancake .. This is a new method to eat it almost like a phulka ;)) must try ! Bookmarked ! Thanks Kalyani. Added a few more pictures of an even quick process. Hope it helps. Thanks Nishpraph. For bajra I use hot water to knead the dough and the roti comes out well. Never tried cooking the dough like this ragi ki roti so I wont be able to tell much. Please let me know if you try bajre ki roti this way. That's a super easy health food recipe, was wondering if we can follow the procedure while making bajra roti? Making the dough is interesting - never done that before. 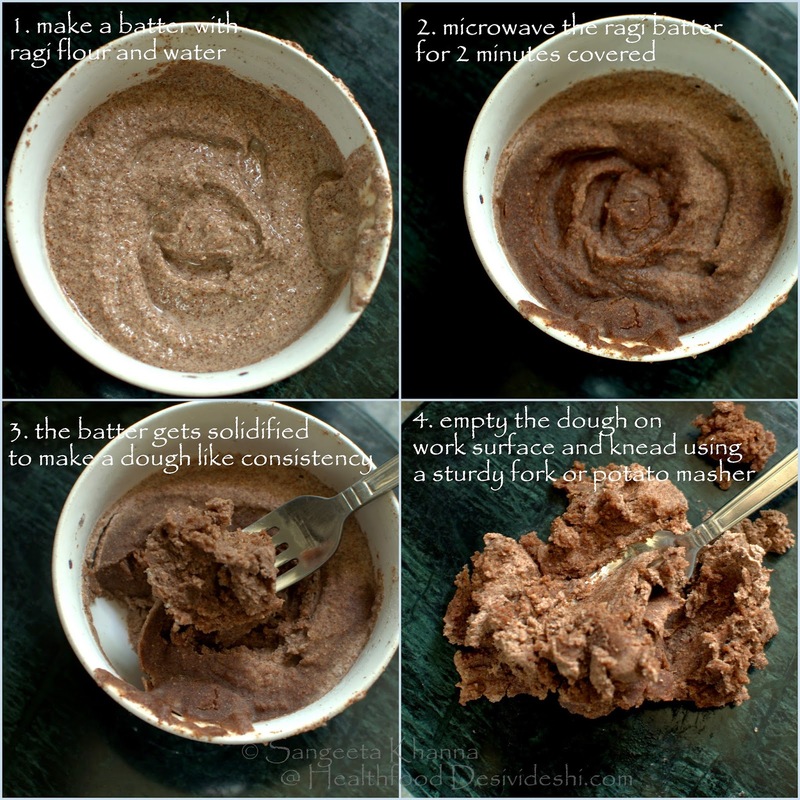 And since I use Ragi a lot, I should try making the dough this way. Damn easy. If I need to cook on the stove, how long should I cook Sangeeta ?? Depends on the quantity Uma. The dough should get sticky and dark in color. It can be eaten with which sabji ? You can eat this roti with any subzi you wish. We love this ragi ki roti with all types of subzi and daal in fact. Hi Sangeeta, can we keep this dough in the fridge for later use? I tried keeping mine and it came out rock-hard... any tips?? Hi Richa if you are planning to keep the atta refrigerated I suggest you keep it without the steaming step. Take out from the fridge when required, steam a little, knead again and then make the roti. It is better to make the roti, cook it half done and then refrigerate. Cook once more on direct flame when required and serve hot. I hope it helps. I think the prepared steamed dough can also be steamed again to make it softer. That worked wonderfully! Thank you so much!